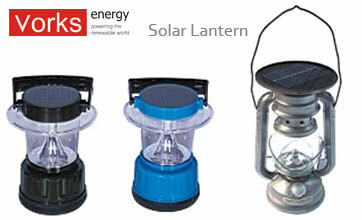 Utilized the power of the sun, these Solar Lanterns provide unique night time lighting. A built in light sensor detects changes in lighting conditions and automatically turns the Solar Lantern on or off. Each Vorks Solar Lantern has multiple functions allowing the Solar Lantern to imitate the look of a flickering kerosene lantern or a solid bright light. Vorks Energy crafted each Solar Lantern to be weather and water resistant, each Solar Lantern requires no wiring and includes a Sheppard's hook for permanent ground placement. Suitable for border lighting or on your next camping trip, the Solar Lantern is a versatile and environmentally friendly way to light up your evenings!